Now that the dust has settled after the much-awaited FOMC statement, let’s break down what happened and figure out how it could affect the U.S. dollar’s forex price action. Spoiler alert: Dollar bulls weren’t so impressed and John Snow gets killed. WILL THE FED HIKE INTEREST RATES IN SEPTEMBER OR WHAT?! Woah, take it easy… I can feel the impatience right there! This is probably how most forex market watchers have been feeling for quite some time, and the June FOMC statement failed to provide any strong hints on when monetary policy tightening might take place exactly. Trust Yellen to play with everyone’s feelings as usual! In her press statement, Fed Chairperson Yellen said that no decision has been made on the actual timing of their liftoff, which is the term FOMC members are using to mark the start of their tightening cycle. She even tried to downplay the importance of the first Fed rate hike by saying that the trajectory of their policy (another fancy term for the longer-term path of interest rate changes) is what truly matters. With that in mind, the FOMC unveiled their dot plot of projections, which should give the markets an idea of where each policymaker thinks interest rates should be over the next few years. Anybody else seeing a nice little bowl for 2015, a couple of aliens for the next couple of years, and a spaceship for the longer run? Well, economic experts say that this dot plot implies that TWO interest rate hikes might take place this year since policymakers projected that the benchmark rate might eventually move past 0.5% from its current levels of 0 to 0.25%. 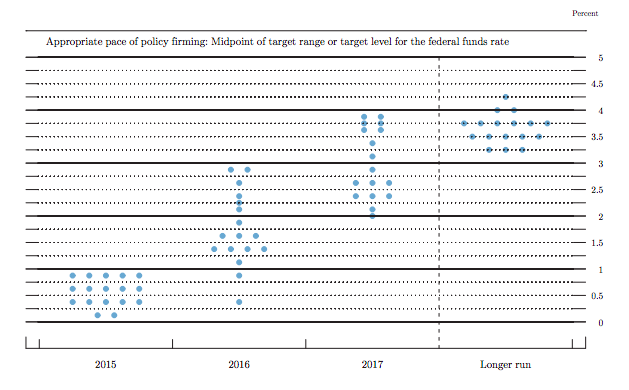 Note that this dot plot doesn’t actually guarantee any policy changes, but it’s the closest thing we’ve got to tightening hints from the FOMC so we’ll take it! Two rate hikes, huh? Do their economic estimates support this? As discussed in my FOMC preview article, the Fed decided to lower their GDP estimates for the current year in order to take the Q1 slowdown into account. They also adjusted their 2015 unemployment rate forecasts slightly higher from their 5.0% to 5.2% estimate in March up to around 5.3% this time. Inflation estimates for this year were unchanged since Fed officials are still counting on the effects of the oil price slump to keep fading. FOMC members are more optimistic about an economic recovery for 2016 and 2017, as they upgraded their growth and inflation forecasts for those years. Yellen has emphasized that any policy changes would continue to be data-dependent, which implies that any sign of a strong pickup in the next few months could fuel speculations of an interest rate hike. What about inflation and U.S. dollar strength? The June FOMC statement didn’t seem to dwell too much on the downturn in price levels, which suggests that policymakers are no longer as concerned about weak inflation as they used to be in their previous announcements. Yellen acknowledged that the drop in energy prices has been mostly concentrated towards the end of 2014 and early this year, citing that price levels seem to have stabilized so far. When asked about the dollar’s impact on overall inflation, Yellen admitted that it is still a factor affecting their outlook among many others. “In spite of the appreciation of the dollar the committee obviously thinks that the economy is likely to do well enough to call, likely call, for some tightening later this year,” she mentioned. Yellen also added that they are counting on improvements in the labor market and wage growth to keep growth and inflation supported. With that, forex traders could pay closer attention to jobs data and earnings figures to judge if the U.S. central bank will stay on track to announcing a rate hike soon.